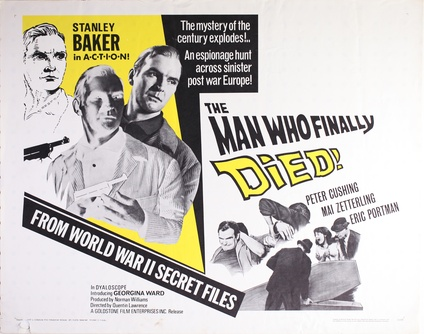 Acquiring this Stanley Baker starring feature accomplished two points of interest for me personally. Not only had I not seen this feature film since a late night airing eons ago but it allowed me to put a checkmark next to the films of Peter Cushing in my collection as well. It’s a black and white mystery thriller from director Quentin Lawrence who according to the IMDb had already directed this story as a 1959 television show that featured Nigel Green who also appears here in the feature film version. It’s a poor man’s Hitchcock thriller that kicks off when Baker receives a phone call from his Father inviting him to a small German town to reunite. By the time Baker arrives, his Father is dead and buried and to deepen the mystery, Baker assures locals that his Father had supposedly died a good twenty years earlier. Baker it turns out is the son of a WW2 SS Officer in the German Army. His mother was English and she took him as a small boy back to England and he never saw his Father again. He has always believed his Father died nearing the end of the war. Upon visiting his Father’s estate, he’ll be surprised to see his childhood Nanny which only adds credence to the thought that his Father somehow survived the war and when no one is giving him any straight answers, his suspicions circle around the thought that his Father may in fact still be alive. What he does find at the home of his Father is a stern and cold Peter Cushing as his Father’s friend/doctor and Mai Zetterling as the widow. Crank up the melodramatic music which rears it’s overly large head on many occasions throughout Baker’s journey to the truth. Not helping matters are the local police played by the brutish Green and Inspector Eric Portman who don’t like Baker meddling about town and upsetting the deceased’s daughter, the debuting Georgina Ward. ( I’m not sure but doesn’t that make her Baker’s sister? It’s never really mentioned.) The trail will lead Baker to the graveyard where he wants the body exhumed and to see Dear Peter Cushing standing nearby seems so fitting for us fans of his Baron Frankenstein. Escalating the mystery is an insurance investigator played by Niall MacGinnis who represents a firm that must pay out a large life insurance policy. MacGinnis who had previously worked with Baker on Helen of Troy is pulling the strings and using Baker to get at the truth. Or is he…. no one is quite what they seem and I guess that even includes Baker since he’s been living under an assumed name to distance himself from his Father’s affiliation with the Nazi regime. So who is the old man that Cushing has hidden in the depths of the estate? And just who is the real villain here? Stick with Baker and his ultra cool dark shades and you’ll figure it out. I would think that a film like this is one that can be found on most any actor’s resume. Passable entertainment that is far from memorable but constitutes a payday. Having said that, Baker looks great here with his dark glasses despite the film being somewhat muddled in the end. Buried in here is a much better film than what we wind up with so perhaps a surer hand directing and tighter script might have elevated it to a title that is memorably recalled when talking of the careers of both Baker and to a lesser degree, costar Cushing. Having had it’s roots as a TV show, it has that Twililight Zone flavor to it and I suspect that that’s what the producers were aiming for when the film was released to audiences both at home and abroad. The producer credited to the film is Norman Williams. This proved to be his final production and while looking over his credits, he also produced The Errol Flynn Theater series in 1956-7. With a bit of luck, perhaps Errol’s TV show might turn up on home video. Should you be hoping to secure a copy of this black and white mystery to finish your catalogue of Baker/Cushing titles, you might have to get it through it’s UK release as I don’t believe it’s been released here in North America and from what I can recall, seldom turns up on cable TV. I haven’t seen this one yet, but it sounds like a really cracking flick. That cast sounds amazing. I love Eric Portman quite a bit and consider him somewhat underrated. 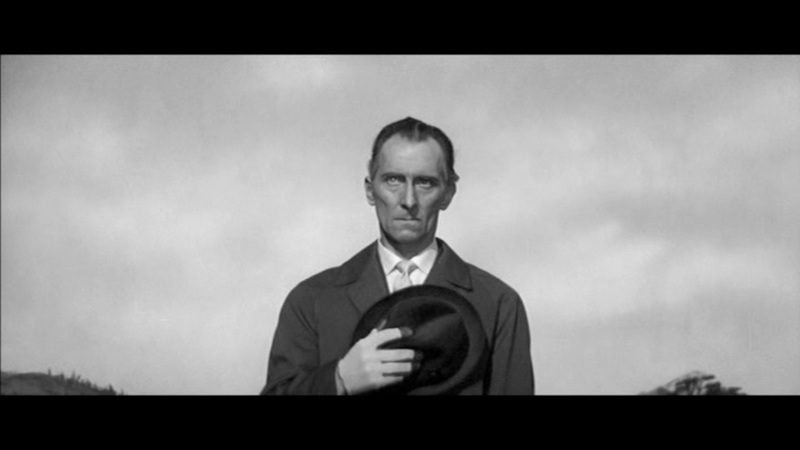 Cushing was class in whatever he appeared in. Stanley sure does look cool in those sunglasses! It has a nice feel to it, just comes a bit short I thought but yes, Stanley does indeed look good in the shades. Peter was a classy man and it’s funny that he’s known for the Horror flicks. Supposedly one of the gentlest men one could ever meet according to any one I’ve heard speak of him who had worked with him. I need to revisit this. I saw it on TV years ago, pretty late, and I think I fell asleep and wasn’t able to finish it. Probably the same airing I saw, a long time ago and late at night. Never seen it since or noticed it in a guide since either. Man, I’ll watch Cushing in anything though. I especially like seeing him in roles outside of his norm. I too will watch Peter in anything and have close to all his films. One I don’t own and never thought I’d ever see is the 1977 title Hitler’s Son but it turned up on youtube! couldn’t believe it. Hey! I have a day off from work today, so I’m getting caught up (hopefully) on tons of activities I’ve fallen behind on, including your reviews. I don’t want to overwhelm you with comments, so I’m going to read your posts throughout the day and ‘like’ them until I get caught up again. 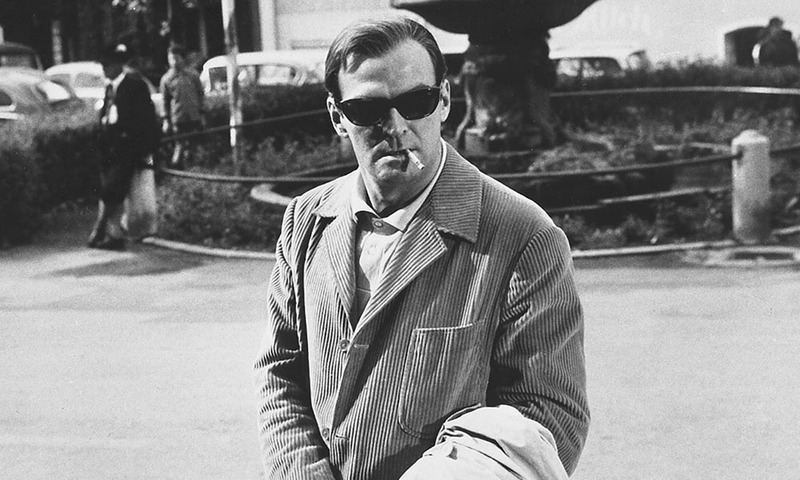 But I will say, thanks for introducing me to so many cool Stanley Baker films, most of which I’d never heard of before! He delivers! I’ve always liked him on screen from my earliest memories of Navarone and Zulu. Hell is a City and Hell Drivers really opened my eyes to his on screen persona and it’s power. I was going to ask you which Baker films I should check out first…thanks for answering that question ahead of time! I’ll see if I can find his two ‘Hell’ films to rent or borrow somewhere.